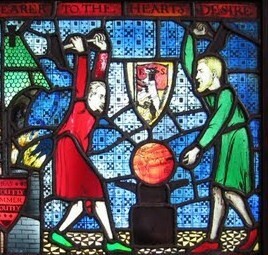 In the famous Fabian stain glass window designed by George Bernard Shaw there is a depiction of a man beating the earth with a hammer and under it the caption “remold it nearer to the hearts desire”. The idea that the more enlightened among us need to work to reshape humanity, mold it into something better. The Progressives in the United States have been very much the sisters of the European Fabians. They too see the world as needing to be molded by a masters hand. The early progressives based their ideas on Darwinism. The idea being that if nature was improving with each generation so was man and as in nature there were those more advanced then others. Following this reasoning they came to the conclusion that if society was properly directed it could be improve at an accelerated pace. Thus as the Fabians sought to hammer out a better society the Progressives sought to push society to progress to a higher state. In this lies the crux of progressivism, the desire to mold the world into what they think it ought to be. Where as conservatives try to protect society progressives egg it on to something they hope will be better. What usually gets lost in their excitement to move on to something better is whether that thing is actually an improvement or will work like they dream it will. The economist Milton Friedman described this as wanting to be judged by their intentions not their results. Obama’s energy plan is a good case in point. He has invested billions in renewable energy while at the same time hog tying the oil and gas industry. The intention has been to jump start us into a future powered by renewable energy. His lofty goal is to move the U.S. towards 80% clean electricity by 2035. To help achieve that end he invested $535 million into a solar plant in Fremont California which just recently closed. This was just part of a 38.6 billion dollar DOE (Department of Energy) loan guarantee program. Like many other governmental programs its successes are almost as bad as its failures. Take the example of the wind farm in Oregon that is going to produce 35 permanent jobs for just a measly 37 million dollars each! Some of this program’s future projects promise to create jobs that cost even more. Of course these are loans that supposedly will be paid back (unless the companies go bankrupt). In addition to loans the government is also throwing around huge grants that never have to paid back like the 100s of millions that have gone to the big three to advance electric car technology even as the GM’s volt shows anemic sales. All of this is coming at the expense of private sector jobs. In fact a study by the King Juan Carlos University in Spain showed for every job created by government in renewable energy it cost 2.2 jobs in the private sector. Not a stunning endorsement for the President’s agenda of pushing green jobs initiatives when the country is suffering over 9% unemployment. On the other end another study shows there is a potential for well over a million jobs in the conventional energy sector jobs waiting to be unleashed if the government would just get out of the way. Jobs that will not cost the American taxpayer a penny. Add to that the recent attempt of the EPA to shut down coal power plants, an act that would of made electric rates skyrocket and increase job losses, you start to see a pattern. The agenda is preeminent, it may be bent around whatever the circumstances are at the moment, but it trumps all other considerations including jobs. As Milton stated, progressives mean well. Progressives meant well when they passed prohibition but consequences for the country were widespread and deeply felt. Roosevelt’s NRA (National Recovery Act, later declared unconstitutional) was meant to spread jobs and stabilize economic activity but as soon as it passed industrial production dropped 25%. Social Security and Medicare have great intentions but now they have made millions of seniors dependent on the government we find they are bankrupting the country. The minimum wage was meant to put a floor under wages but has decimated teenage employment especially minority teenagers. The crises we are experiencing now started with progressives deciding the world would be better if things like a down payment and a credit history were not used to keep people from owning homes. Today the NRLB is trying to shut down a new Boeing factory, again in the middle of the worst recession in decades. The banking industry is about to get hammered by a set of regulations that do nothing to address any of the main problems that led to the melt down in the form of Dodd-Frank. Of course then there is Obama care that is going to add a huge regulatory burden, decrease privacy and choice as well as being the source of one of the greatest tax increases in history. It does this all the while not accomplishing what it set out to do, namely insure everyone. The history of progressives is one of good intentions with bad results. Not that everything they have done is so destructive but the majority of what they have tried has had bad or even disastrous results. Progressives see what they believe is the next step in the evolution of human society and they see it as their duty to help achieve it. The problem with all their lofty aspirations is they lack a foundation. The past is history and they are all about the future. To them the tried and true is nothing but the old and worn. They tend to react negatively to any ideas that they see as in the way of their goals (this is the basis of much of the antagonism they show towards Christianity and conservatism in general). Herbert Croly of the progressive liberal magazine New Republic once said in an interview “If there are any abstract liberal principles, we do not know how to formulate them. Nor if they are formulated by others do we recognize their authority. Liberalism as we understand it is an activity.”* Inherent in all this is the arrogance that they know better how to direct peoples lives than the people themselves. Progressivism is philosophy forever trying to move society forward without relying on the compass of experience. Directing others to places they have never been except in their dreams. They cloak themselves in their good intentions but always are somehow blind to the results of their actions. Right now we are again awash in progressive good intentions, maybe it is time to pray God save us all! * From The New Republic by Herbert David Crowley Volume 50 page 35 published in 1927.